In Coordinator project, I have two AC Reactive parameters where, and type of both is Checkbox. The second parameter references the first and it should react when the first parameter changes its value. 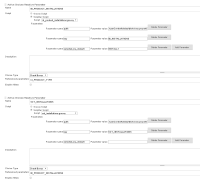 The first parameter has more than one option (check boxes) where one is selected by default, but when I change selection on the first parameter (check some other options), and check the value of the first parameter in the Groovy script in the second parameter, it always returns only default selected value (INSTALL1), other selected values are not detected by the second parameter. If I change choice type of the first parameter to radio button or multi select , everything works fine. Not yet Branko Todoric. I committed with the wrong Jenkins JIRA ID, but so far no changes in the code specifically for this issue. We are aiming at releasing 1.5.3-alpha to the experimental update center this Friday afternoon NZ time. Will try to take a look on this issue before, and maybe include it too. Otherwise, the 1.5.3 will be released on the second week of December if nothing goes wrong. Was this fix ever released? I am running into this issue on 1.5.3 where a Groovy script in the second parameter won't return any value when the parameter is of type checkbox but does have a value when I change it to radio or select. John Lemp added a comment - 2017-03-15 20:59 Was this fix ever released? I am running into this issue on 1.5.3 where a Groovy script in the second parameter won't return any value when the parameter is of type checkbox but does have a value when I change it to radio or select. Hi John Lemp, not yet. I'm working on 1.5.4, and this issue has been initially triaged for this release. There is only one issue confirmed in 1.5.4 for now (remove custom stapler proxy). I'm still looking how to combine the issues we have in a new release with not much risk for users. Hi Bruno P. Kinoshita, has this fix been released by now? Hi Marko Andrijevic, our releases are blocked until scriptler plugin issues are solved, and it's whitelisted again Feel free to ping the mailing list if you'd like an update on scriptler-plugin. So far I'm fixing the issues in active-choices, and what we can do in the meantime is to release to ([BioUno Update site]http://biouno.org/jenkins-update-site.html) if that works for you (cc Ioannis Moutsatsos).